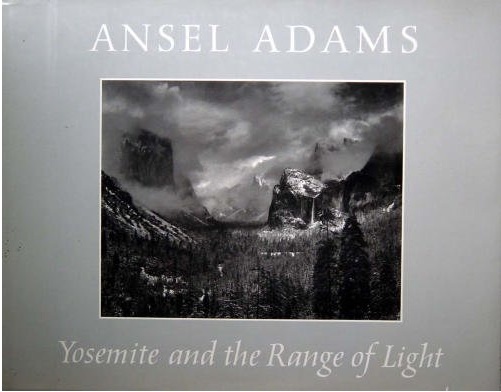 Thought I’d start off with one of my favorites, Yosemite and the Range of Light. Either you like Ansel Adams or you don’t. I do and I love seeing his prints large. I get as much enjoyment wandering within the detail of Adam’s prints as I do trekking through a beautiful alpine valley… maybe even more. And I can do it anytime I feel like. I marval at how Adam’s has transformed reality into a lush haven of b%w tones demanding and getting my attention. If anyone has tried to immolate Adam’s work,they fully understand that his interpretations differ from what’s there. The beauty of b%w is its inherant ability interpret at the outset when it takes away color. I had never thought much about b&w photography until I discovered the image Mount Williamson by Adams. It changed my life and motivated me to do b%w photography. That image is in this book along with some of my favorites, Winter Sunrise, Sierra Nevada from Lone Pine; and Clearing Winter Storm. So when I go from page to page in his book, I not only see a beautiful landscapes, but I feel Adam’s passion for the mountain world… and I can identify with that.